Lawmakers approved a proposal to provide legislative guidance for the state Department of Insurance regarding direct primary care agreements. LB817, sponsored by Ralston Sen. Merv Riepe, adopts the Direct Primary Care Agreement Act and confirms that such agreements do not constitute insurance or function as qualified health plans pursuant to any federal mandate. Among other provisions, the bill stipulates that a practitioner in a direct primary care agreement is prohibited from billing a patient in any form for primary care services provided under the contract. It also requires a practitioner to provide 60 days’ notice in advance of any changes to the contract. LB772, introduced by Columbus Sen. Paul Schumacher, updates Nebraska law to address group-wide supervision of international insurance groups. Provisions of LB819, introduced by Omaha Sen. Brett Lindstrom, were amended into the bill and provide new corporate governance reporting standards for insurers and risk retention groups. 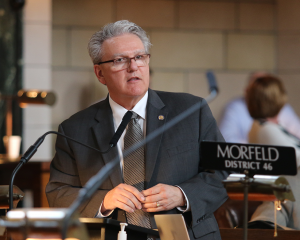 LB873, introduced by Sen. John Murante of Gretna, would have enabled the state of Nebraska to take title of unclaimed, mature U.S. savings bonds five years after the bonds become unclaimed property. The bill was considered by the committee but did not advance.